How many of us are retiring, or planning to retire and how will we cope financially? This was looked at in the recently released Roy Morgan Report on Financial Risk. The number of people intending to retire in the next 12 months is estimated at 415,000, a 27% increase on the level seen in 2008 when it was 327,000. Men represent 228,000 and women 187,000. The magnitude of the intending retirements, combined with the fact that their average retirement funding is inadequate for being ‘self-funded’, is likely to increase substantially the need for government support. 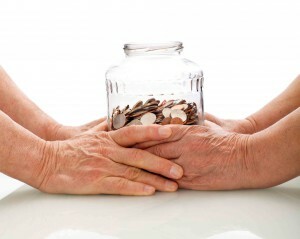 A major problem facing the Australian government and individuals is how to fund the retirement of an ageing population. Superannuation, through its tax concessions and compulsory nature, has been the main way of trying to achieve this and is having some success. 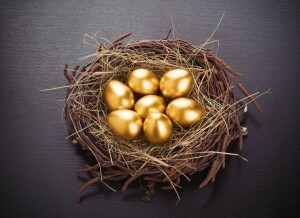 How ready are intending retirees to fund their retirement? We need to understand how well equipped those intending to retire in the next 12 months are to fund their retirement and the role superannuation will play. Currently the average gross wealth (total assets excluding owner-occupied homes) of intending retirees is $306K, up from $231K or 32% in 2008. Source: Roy Morgan Research: 12 months to June 2008 (n=507) and June 2016 (n=443). Base: Australians 14+ intending to retire in the next 12 months. 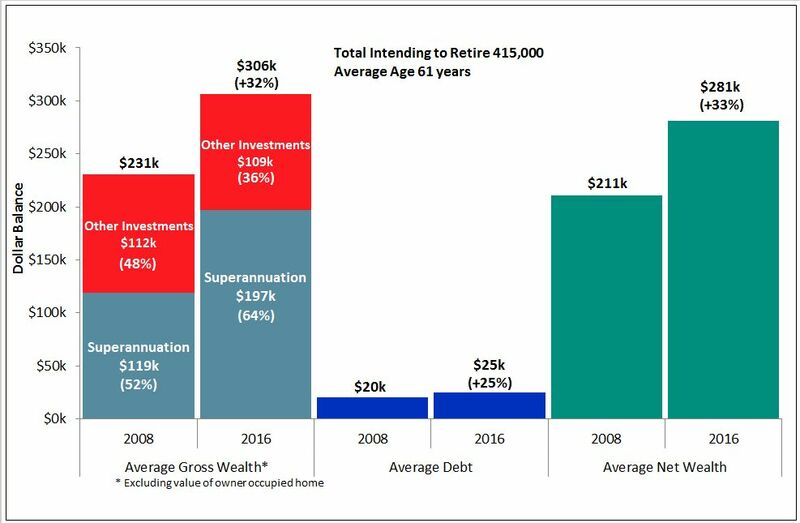 Superannuation is playing an increasing role-now representing 64% of gross wealth in 2016, up from 52% in 2008. Although the average debt level for this group is currently only $25K, it does reduce their average net wealth to $281K, which is generally inadequate for self-funded retirement. The overall conclusion from this is that intending retirees will be relying on government benefits for some time yet, given the fact that the Association of Superannuation Funds of Australia (ASFA) estimates that an individual would need $545K and a couple $640K for a ‘comfortable lifestyle’. Given the very low interest rates at the moment and the level of economic uncertainty, the amount required to fund retirement is likely to rise well above these levels. This is likely to negatively impact the proportion who become ‘self-funded’ retirees and as a result place more reliance on government benefits. Although owner-occupied homes are generally not considered to be part of retirement funding, their potential is obvious given their high value compared to retirement savings levels. We have seen that the average net retirement savings per person for those intending to retire is only $281K, well below what is required. 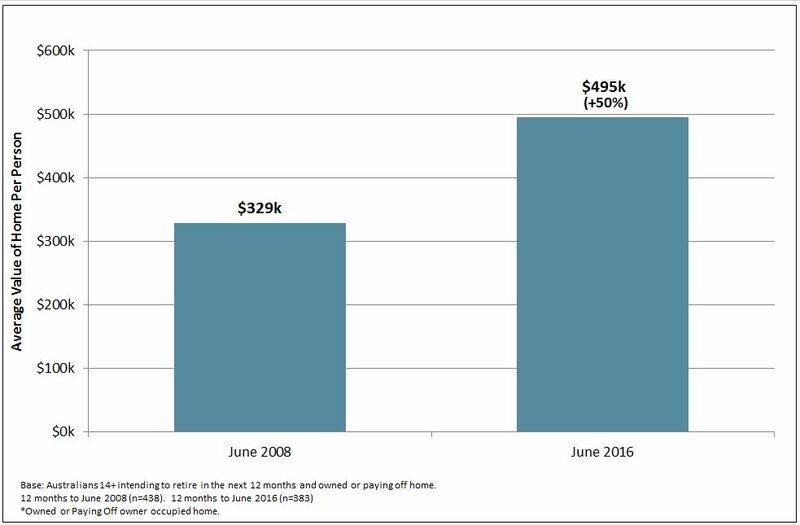 A clear majority (83%) of these people either own or are paying off their home, with an average value of $495K per person or 151% higher than the average held in superannuation. Not only have owner occupiers got a large potential source of retirement funding but the growth in the average value of their homes has increased by 50% per person over the last eight years compared to only 33% for other investments. 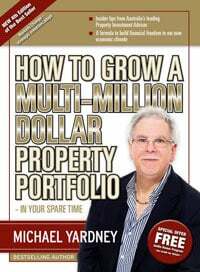 Those intending retirees who rent obviously do not have this large potential retirement funding resource. “The average level of savings and superannuation for those intending to retire in the next 12 months is well below what is required to be able to lead what ASFA describes as a ‘comfortable lifestyle’ or with no reliance on the age pension ie. being ‘self-funded’. The low levels of retirement savings will put more pressure on government funding for some time yet unless there are changes to eligibility rules, taxation or superannuation regulations. “Many intending retirees have a substantial proportion of their funds outside of superannuation, which may be due to not understanding the benefits, not qualifying or being unsure about superannuation with all its rule changes. There will be a major education role for government to make clear what the rules are particularly when the current proposed changes have been sorted out. Superannuation is a very long-term investment which presents a major challenge to engage young people, a task made even more difficult if there is uncertainty about what the rules will be regarding access to funds in 30 years or more. “Intending retirees who own, or are paying off, their home, have a major potential source of retirement funding.